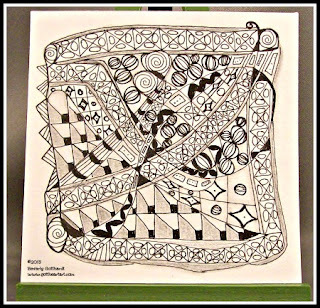 Way back on Monday Laura challenge us to use two pencils held together to create our string for this tile. As usual the week has gotten away from me and I forgot to take a picture of my tile before I started tangling. You experienced tanglers will probably be able to suss out the the string through all these very busy tangles. However, I did remember to write down the main tangles I used: Nzeppel, Printemps, Cubine, Zander, Za, Diamonds & Pearls, and Melon. There are some swirls and lines for fill ins that I don't think really count as tangles. I didn't really intend for this one to get so busy, but here you have it. 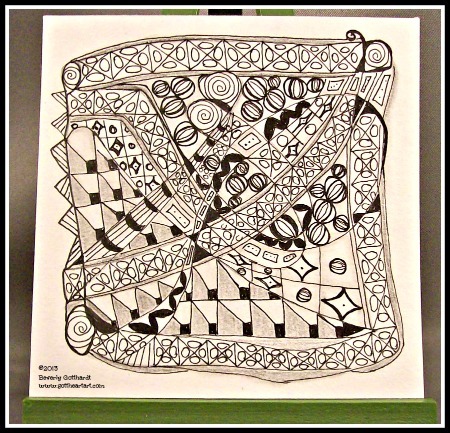 This may be busy, but it also has a lot of beautiful tangles!